Take this with a grain of galactic salt, but what if Han Solo didn’t make the Kessel Run in the Millennium Falcon in this new Disney-owned Star Wars timeline? If we’re looking at the SW canon as it stands right now, Han never once says that HE was the pilot who completed the route in less than 12 parsecs — he says the Falcon did. So, what if it was Lando who actually completed it? We know he owned (or at least had possession of) the Falcon before Han did, so it’s not outside the realm of possibility. Yes, we know that in some of the now-non-canon EU (expanded universe) books (namely the “Han Solo Trilogy” by A.C. Crispin) we get an account of Han and Chewie completing the run, but in the films, Han never confirms that HE was the pilot during the run. 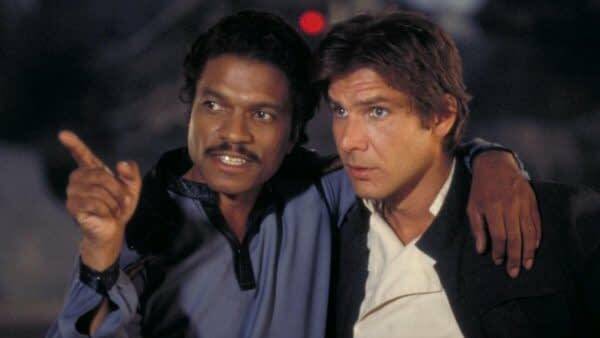 “It was the ship that made the run, not the captain,” Lando says. The next line in the scene in the book from Lando tells the fake-Han that he “wasn’t even born when THE run happened.” Yes, we’ve ordered a copy for further investigation. Empire‘s Solo-centric issue has even more information about the famous route, diving into the Spice Mines of Kessel, and another mention of Han “claiming” to have done the run. There is yet further evidence we’ll get a mention of the Run in the film — the toy packaging for the upcoming Solo solo film (eww, we know, that whole thing with the knockoff Russian art that was actually real art) labeling the movie Falcon “the Kessel Run Millenium Falcon”. Specifically, the official LEGO set. Maybe we’ll get an answer to this 12 parsec question when Solo: A Star Wars Story opens in theaters on May 25th.